SEATTLE—December 17, 2014— “Your mother warned you about us!” reads the doormat welcoming guests into Hard Row to Hoe’s second tasting room in Leavenworth, Wash. Currently in its soft launch, the tasting parlour, located at 837 Front Street, Suite A, celebrates its grand opening on Friday, January 9, 2015.
moved to an old hotel a half mile further up the lake the lake to "serve" the miners. History tells us that since there were no roads or trails connecting Lucerne to the old hotel, a long-time Manson resident ran a rowboat taxi service from Lucerne to the old hotel in support of the thriving enterprise. 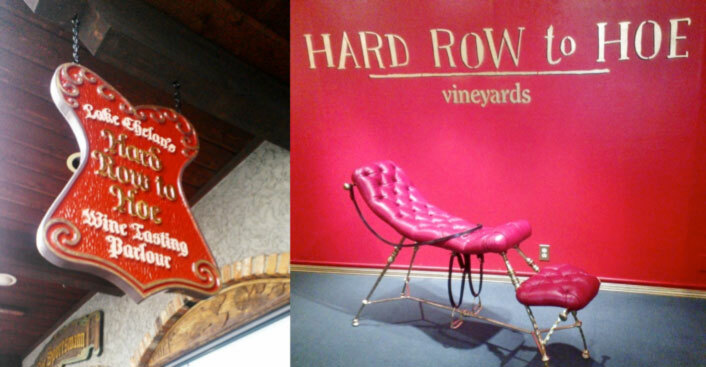 The winery is named for the American idiom “hard row to hoe,” which takes on a literal sense, given the back story. Owner/winemakers Don and Judy Phelps have infused the winery’s provocative roots throughout the guest experience, from the moment one approaches the Leavenworth location’s corset-shaped sign and the afore-mentioned custom doormat. As one descends into the basement, a glowing neon sign behind the bar encourages guests to “Swallow” while another indicates that these are “Wines with Great Bawdy.” Looking for the perfect prop for the Leavenworth location, Don and Judy procured the Tally Ho Chair, featured in the forthcoming Fifty Shades of Grey film. The boutique winery is all work and all play, delivering premier wines created by Judy, the winemaker, who holds a Masters in biology and certificate in winemaking from UC Davis. Don serves as expert grape grower and manages the vineyards. Founded in 2004, Hard Row to Hoe produces an average of 18 different wines each year, approximately 150 cases each, for a total of around 3,000 cases annually. The winery is known as a pioneer of Lake Chelan’s booming wine industry, due to their innovative growing practices and grape varietals, and the award-winning wines that result, including Cabernet Franc, Syrah, Malbec, Sauvignon Blanc, Riesling, Viognier, Chardonnay, Methode Champenoise and Pinot Noir. Due to the limited distribution, many of the wines offered are exclusively available in the tasting rooms. Specialty offerings include the second iced cider ever produced in the U.S., Ice Breaker, which is made from local Lake Chelan braeburn apples. The soft-launched tasting parlour is open Tuesday – Sunday from noon – 6 p.m. These winter hours will remain the same after the grand opening. For more information, contact Tamara Wilson at 206-409-6735, or call the tasting parlour at 509-888-8266.